What am I doing in Colombia this time? I’m starting with this photo just to get your attention. I was staying in home of Isabél. Her cousin Salamé lives next door. They both will turn 3 later this summer. 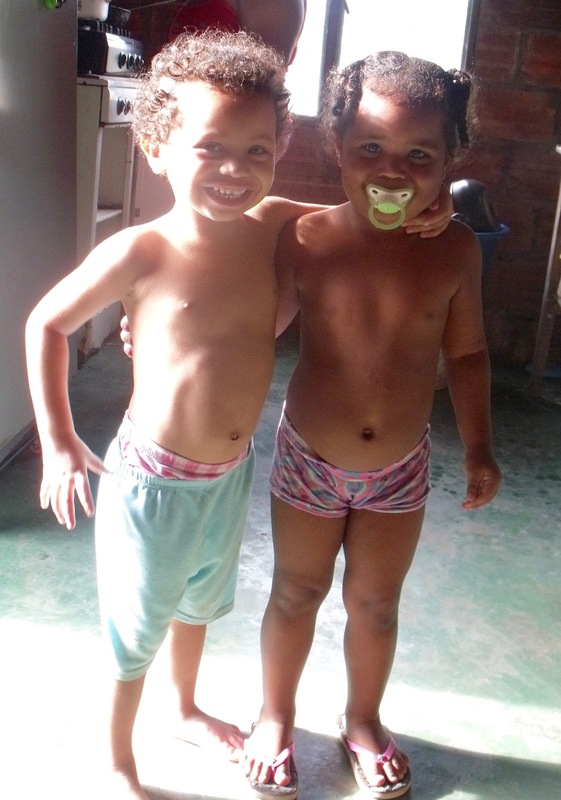 Isabél’s mom had given her an empty cooking oil bottle and Salome a plastic cup just a few minutes before. They left, I assumed, to go outside and play, but it turned out they were running across the muddy street, past the calf, into the back yard of the house next door, past the sleeping pigs, through grandma’s back door, through her house, and into the little store that faces the street on the other side. They returned with the bottle full of oil and a half cup of sour cream. When’s the last time you sent your two-year-old out shopping? 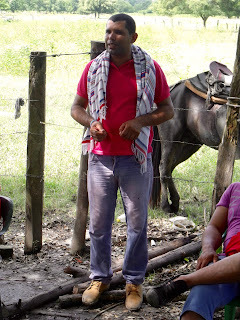 It was the fourth time I had been in the tiny town of El Guayabo, this time to celebrate the cancelled eviction of several families from their small farms. 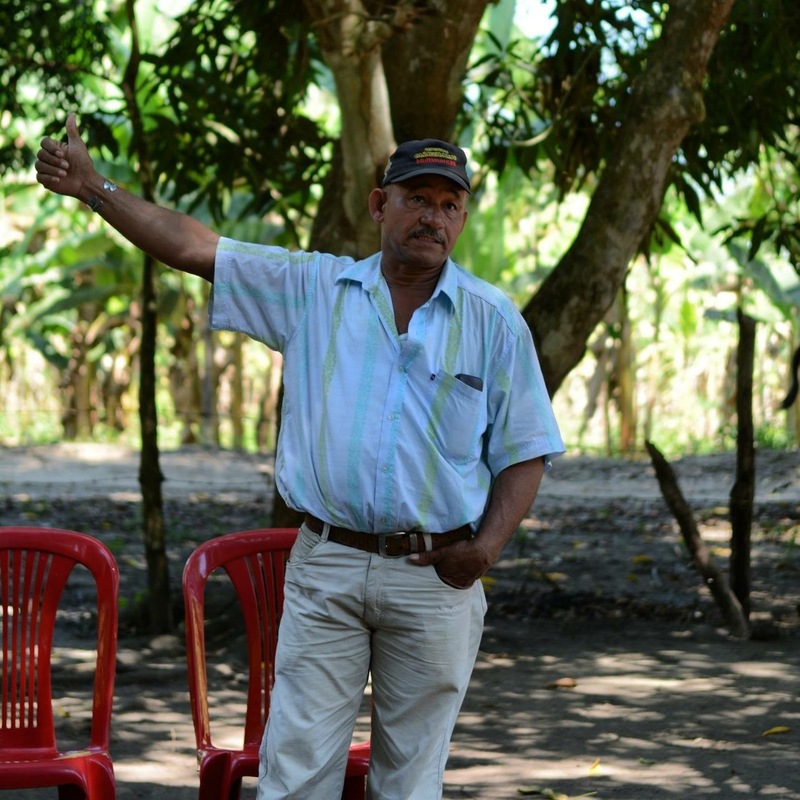 Isabél’s father Erik is one of the four primary community leaders. The local judge had sent out a notice on June 29 that the police would be carrying out the evictions on July 5, despite the fact that 3 of the 4 the court cases involving the land title dispute were still in process. To better understand the history of this particular situation, please check the articles I have linked at the end of this blog. This community is being supported by several Colombian and international human rights organizations. Christian Peacemaker Teams and a Swiss organization do direct accompaniment of threatened individuals like Erik. Other organizations are working on the legal side. A Colombian group called Justapaz that was born out of the Colombian Mennonite Church in 1995 and another group went to Bogota with 3 representatives of the community that same Friday June 30 and were able to get the ruling that set aside the eviction for now. The way it worked out, getting that ruling delivered and acted upon didn’t actually happen till late afternoon on the 4th of July. It was a very stressful weekend, watching and waiting as things unfolded. In the end I was able to be present at the gathering of the community on the 5th that embraced this one important victory. It is only one step, though. One of the community leaders, Alvaro Garcia, has been in prison since April 24, 2016 and actually just had his first hearing of witness testimony on July 5. Those testimonies were not finished, and the next hearing date is in September. I got to visit Alvaro in prison the day after I arrived. He is healthy but frustrated and deeply sad, as we all are, at the lack of accountability and slow pace of the justice system here. Being part of this process is humbling, and I am deeply grateful for the support of friends and family who encourage me to keep making these trips. This is my ninth consecutive year spending a month working in and traveling out of the team office in Barrancabermeja. It is so hard to write these updates, because I have to choose what to leave out. Just in Guayabo I want to tell you about last winter’s flood, the total lack of books, the doubt about the peace accords, the amazingly healthy children. The list goes on and on. There is nothing simplistic about life along the Magdalena River. I encourage you to do an aerial map search to see the town of Guayabo. If you use Googel Maps you’ll need to search first for Vijagual – Santander Colombia, then scroll north on the river a couple miles and El Guayabo will show up. It feels like southern Louisiana along the Mississippi River in July, only hotter. The people of Guayabo are so grateful for our presence and how it allows them to keep focused on the work at hand. We inspire each other.